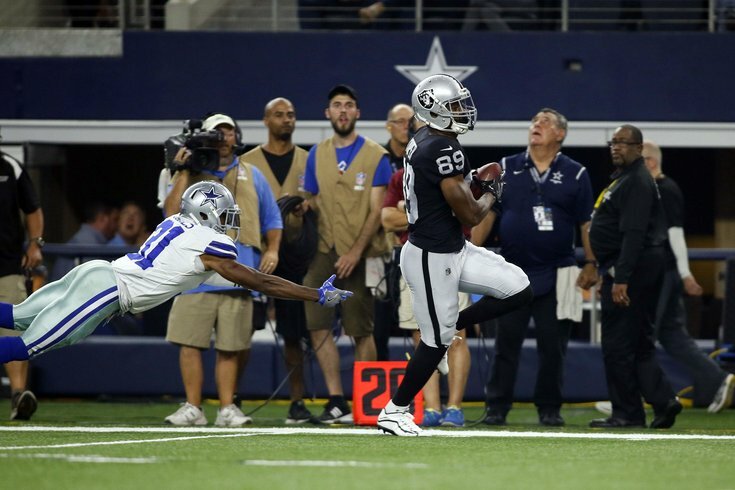 Amari Cooper will make the Cowboys better, but he comes at a huge cost. According to a report from Josina Anderson of ESPN, Jerry Jones and the Dallas Cowboys have traded for Oakland Raiders wide receiver Amari Cooper. Breaking: A source tells me that WR Amari Cooper will be traded to the Dallas #Cowboys. What did it cost? According to Jerraud Powers, it's a straight-up first-round pick in 2019.
Cooper makes the Cowboys better, obviously. The Cowboys receiving corps are led by slot receiver Cole Beasley, who has 33 catches for 350 yards, 2 TDs, and a long reception of a measly 21 yards. Beasley is followed by tight end Geoff Swaim, who has 19 catches for 205 yards, and 1 TD. Of course, Cooper comes at a very high cost. To begin, the first round pick is an extremely valuable resource, obviously, but there's also the matter of Cooper's pay. In 2019, Cooper is scheduled to count for a whopping $13,924,000 against the cap on his fifth-year option. Is desperate Pederson hoping to make Eagles underdogs again? Knowing that the Cowboys aren't going to cut a player they just spent a first-round pick to acquire, Cooper and his camp have all kinds of leverage to either earn a lucrative long-term deal, or play out the 2019 season making just under $14 million. The Cowboys are currently 3-4, and look a lot like, well, a 3-4 team. While Cooper is certainly an upgrade over what the Cowboys already have, he's not about to save their season. If the Cowboys traded for Cooper hoping he puts them over the top, they are delusional about the talent currently on their roster. In 2000, the Cowboys traded two first-round picks for Joey Galloway. In 2008, they traded a one, a three, and a six for Roy Williams. Both of those deals blew up spectacularly on the Cowboys. At least the price is a marginally lower this time.